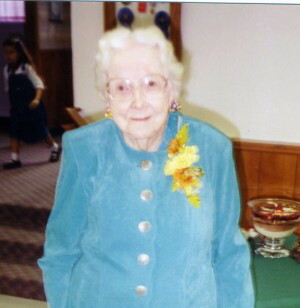 Ethel Wilhelmina Bellamy Schrader, age 96, passed away peacefully at The Manor Care Center in Wellsville on Saturday, April 5, 2008. 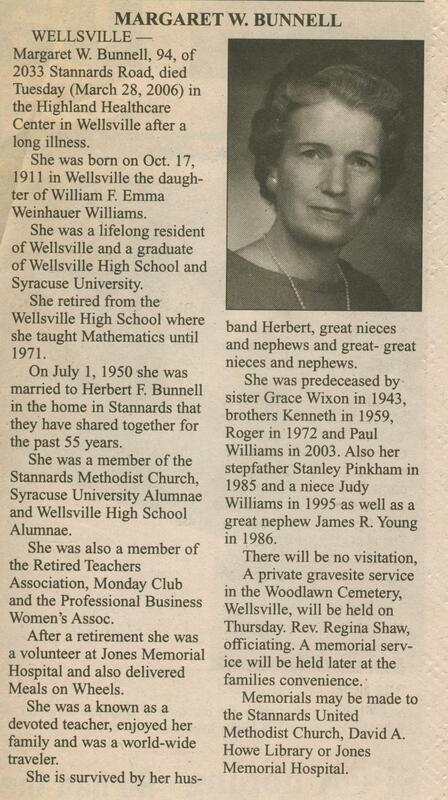 She was born in Wellsville in 1911, the daughter of Charles and Edith Siedentop Bellamy. Her family lived on Niles Hill, and Ethel attended Petrolia Union School, graduating from Wellsville High School in 1929. 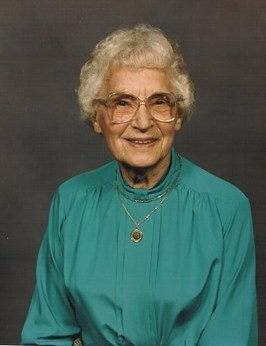 Ethel worked at Elmhurst Dairy from 1930 to 1940. On June 20, 1936 , she married her beloved husband of 63 years, Ervin J. Schrader, and they resided on Riverside Drive, in the house Ervin built, from 1938 to nearly the present time. She was a lifetime member of Trinity Lutheran Church, and a past member of the Trinity Senior Citizens and Ladies Aid groups. She was a wonderful homemaker, known for her love of birds and kitties, her enjoyment of word puzzles and pinochle, and her wit and wisdom. As the family baker, she delighted all with her pies, cookies, and special rolls. Ethel Schrader was related to many of the first settlers in Allegany County. Her great, great grandfather, Silas Bellamy, was an early settler of Scio, where he bought nearly 100 acres of land, much of the present village of Scio. Silas married Betsy, the daughter of Joseph Knight, Scio’s first settler. Ethel’s great grandfather, William Bellamy, cut a sledge road up Niles Hill, where he bought 200 acres and became a successful farmer. The original house still exists near the Bellamy Cemetery on Bellamy Road. Her grandfather, Irwin Bellamy, served as clerk to the Doorkeeper in the U.S. House of Representatives in Washington D.C. While exploring for oil in the Little Genesee area, Irwin met his wife, Clara A. Burdick, whom he married in 1885. Ethel’s Great Uncle William Handy Bellamy was the very popular Sheriff of Allegany County elected in 1903. Ethel’s great grandparents in Little Genesee were Jabez B. Burdick and Mary Ann Jaques. Jabez arrived in Little Genesee in 1827, traveling from Rhode Island with his wife and five children in a wagon with all their possessions. The first year he had to work for other settlers to provide food for his family. Perhaps Ethel inherited her longevity and strength of character from her Great Grandmother Mary Ann, who lived to be 100 years old, and smoked a pipe and hived a swarm of bees on her hundredth birthday. Ethel is predeceased by her husband Ervin and her sister Dorothy Bellamy Woodworth. Surviving are her two daughters, Carol (Daniel) English of Wellsville and Nancy (Dennis) Miller of Livonia, and three well-loved grandchildren, Richard (Lisa) English of Mount Pleasant, SC, David English of Buffalo, and Thomas Miller of Rochester. Also surviving are five nephews, Robert, Richard, David, Donald, and Alan Woodworth. The family would like to extend much appreciation to the staff at the Wellsville Manor for their wonderful support and care of Ethel for the last three years. A special service of remembrance and celebration of her 96 years was held at Trinity Lutheran Church Tuesday morning April 8. There will be an hour of visitation from 10 am to 11 am with a service at 11:00 a.m. with internment following at Woodlawn Cemetery in Wellsville. Memorials may be made to the David A. Howe Library or the Allegany County Historical Society. Teresa Beatrice Healey Vossler, 101, died at home in Lawrence on December 2, 2012. 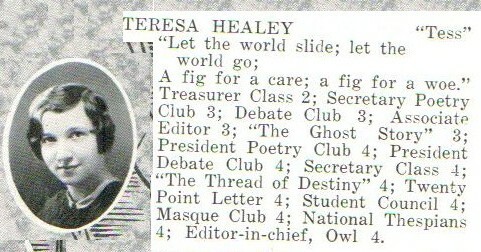 Known as Tess to her family, she was born in Wellsville, NY, on November 17, 1911, the third child and only daughter of Edmund James Healey and Annabelle Harris Healey. Teresa lived in Wellsville for the first forty years of her life, graduating from high school in 1929 where she was an active member of many clubs, holding leadership positions in several. After graduation, she worked as a nurse’s aide and later was a buyer for a local department store. In 1950, Teresa married Roy Vossler whose oil production business brought them to Osawatomie, KS, in 1951. With the arrival of three children in three years, initial homesickness soon turned into a busy and rewarding life of family, new friendships, and community involvement. Teresa opened Kiddie Korner Nursery School in 1968, the first preschool in Osawatomie, which she owned and operated for the next 25 years. Retiring at the age of 79, it was work she loved, and it kept her young. 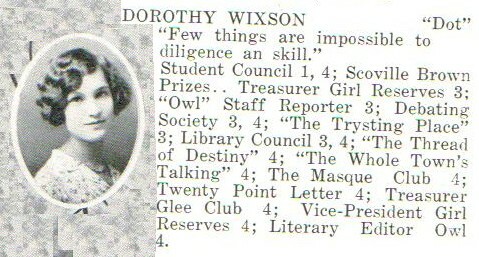 She served on the Osawatomie Library Board and the local United Fund Committee for many years. She was a member of the Miami County Retired Teachers’ Association, E. H. U., and the American Contract Bridge League. She was an active member and frequent officer of the Monday Club, an affiliate of G. F. W. C., serving as chairman of their District Music Auditions for 11 years. Upon her husband’s death in 1971, Teresa was appointed to fulfill the remainder of his term on the Osawatomie School Board. She remained a member of that Board and an education advocate for the next 16 years. Teresa was a storyteller, whose quick wit and lively sense of humor always made for a memorable conversation, even in her final years. She enjoyed entertaining, travel, playing the piano, a good book, a tricky crossword, a trip to the opera, a challenging bridge game, and pie ala mode. She had a true gift for friendship and a natural ability to connect with people of all ages. But most of all, Teresa loved her family. She was preceded in death by her husband, Roy, her daughter, Cathy, and three brothers, George, Edmund, and Robert Healey. Teresa is survived by her son, Steve, and daughter, Sue, both of Lawrence; her son-in-law, Enrique Dos Santos, and seven grandchildren, Steven, Alex, Peter, Craig, Phillip, Merritt, and Jillian Dos Santos, all of Columbia, MO. A private family burial will be held in Osawatomie. A memorial celebration will follow in the spring. Contributions in her memory may be made to the Roy and Teresa Vossler Scholarship, Osawatomie High School, 1200 Trojan Drive, Osawatomie, KS, 66064 or Douglas County VNA, 200 Maine Street, Lawrence, KS, 66044. Louise Ellen Jones of Mesa, Ariz., died in a California hospital Dec. 27, 1979 in a California hospital while visiting her daughter, Mrs. Janet Haas of Ramona, Calif. She was born Oct. 5, 1910 in Bolivar, N.Y., a daughter of Chester and Agnes Corbin. 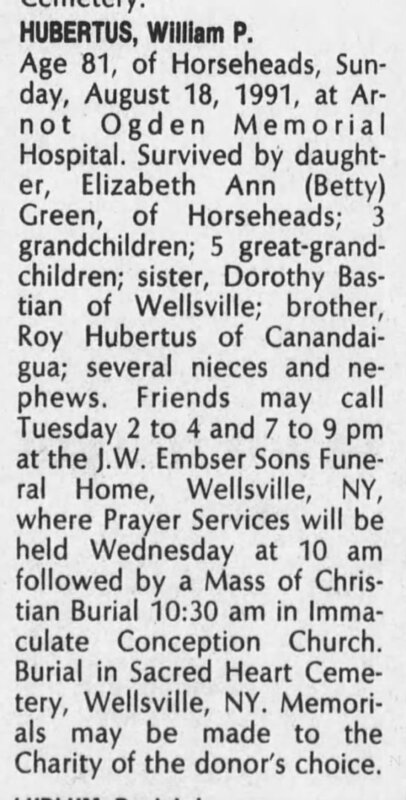 She had been a resident of Wellsville, N.Y., and Belmont, N.Y., for many years. While residing in that area, she was very active in Girl Scout work and in the Jones Memorial Hospital Auxiliary. She was a member of the Christian Temple in Wellsville. 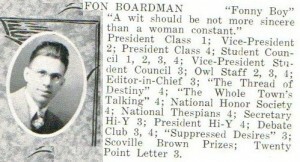 She was married to Edward M. Jones who survives. In addition she was survived by two daughters, Mrs. Haas, and Cindy Jones of Mesa, Ariz; three grandchildren; a brother; and several nieces and nephews. She was preceded in death by a son, Thomas Roland Jones who died in 1971. Funeral and burial services were held in California. Helen McMahon passed away in Tulsa, Oklahoma. The obituary was featured in Tulsa World on November 13, 2009. Duke, George L., Sr., Memorial services for George L. Duke, Sr will be held at Edgewater Point chapel, 23285 Blue Water Circle, Boca Raton on September 1,at 2 p.m. Interment will be in Wellsville, NY at a later date. 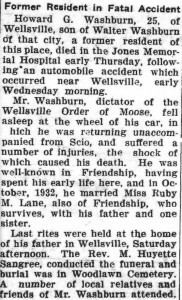 Born in Wellsville, NY, January 18, 1912, the son of William and Ruby Duke. Mr. Duke was a 30 year resident in the Boca area, living at Edgewater Point for the past 20 years. He was a graduate of Alfred University and retired from Westinghouse after a distinguished 28 year career. He was a longtime member of the Deerfield Country Club. He was predeceased by his beloved wife Helen and brothers William and John. He is survived by his special friend, Millie Dennison, his son, George Duke of SC, daughter, Carolyn DeMaio of Pittsburgh, PA. Four grandchildren, Christopher DeMaio, Kimberly Damus, George Duke III, and David Duke. Seven great grandchildren Emily Damus, Michael and Brandon DeMaio, George IV (Chad) and Grant Duke, Gabrielle and Piper Duke. The family requests no flowers. Memorials may be made to a charity of choice. MILTON A. [Musty] GRAVES, Whitesville, 88, of 4192 B Bolivar Road, passed away on Wednesday February 23 at Jones Memorial Hospital. He was born on August 31, 1916 in Wellsville, the son of Cecil B. and Alma (Roeske) Graves. 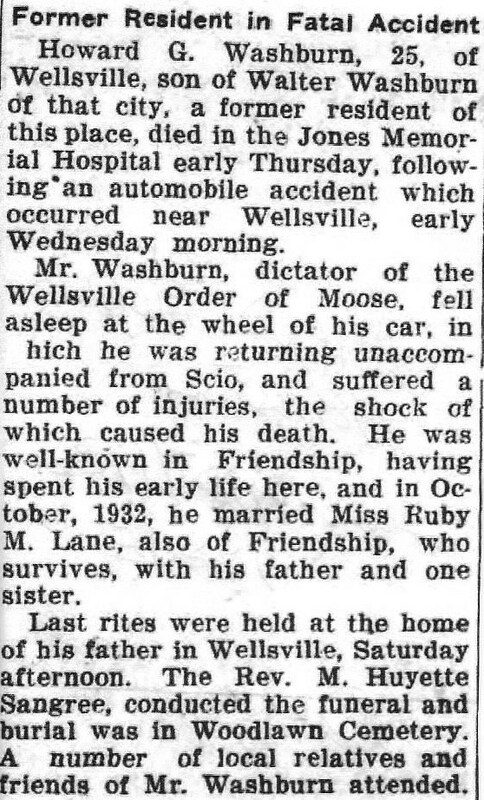 On December 31, 1937 in Wellsville he married Irene H. Marsh who predeceased him April 3, 1973, then again on December 17, 1977 to Thelma Kear Duke, who survives. Milton was a lifelong resident of Wellsville, and a 1929 graduate of Wellsville High School. He was employed as traffic manager by Worthington Corp. of Wellsville for 37 years. For a time he was employed by Victor Aluminum Works in Friendship. He was also a former resident of the proctor district of Wellsville and most recently Cryder Creek of Whitesville. Milton had sent winters in Holiday Florida. He had attended the Trinity Lutheran Church. He sang with the Apollo Club, appeared in the Lions Club Minstrel Show, and was a member of the Blue Devils Drum and Bugle Corps. He was also an avid fisherman, hunter, and gardener.In addition to his wife Thelma, Milton is survived by a son: Max B. (Sandra) Graves of Andover, a granddaughter: Kristie (Dennis) Stebbins of Corning, a great grandson: Kody Stebbins of Corning, and several nieces and nephews. He was predeceased by his parents on the same day in 1975 and 3 brothers Richard, Lee and Lt. Victor GravesFriends are invited to call on Saturday from 1-3 pm at the J.W. Embser Sons Funeral Home, Inc. in Wellsville. The funeral service will follow at 3 pm in the funeral home with Rev. Diane Cox presiding. Burial will be in Woodlawn Cemetery. Memorials may be made to a charity of the donor’s choice.